In a post a while back, I wrote about two proven methods for increasing your happiness. A very important idea from that post is "You're most likely to work on your trading if your trading brings you positive experience." It's when we feel happy and fulfilled that we're most likely to tap into productive and creative energies. It is understandable that competitive traders look to their winnings to bring them their positive experience. This is also where such traders most often lose their positive mindsets. When inevitable drawdowns in the P/L occur, they create drawdowns in energy and attitude. That's when traders often look for their happiness in the same place that they lost it. They hope to regain happiness by regaining profitability. Such an approach does not gain happiness; it loses control over one's happiness. That is why one of the most important performance principles is to approach performance in such a way that the process of doing is what brings fulfillment, not just the outcome. If trading is truly expressing and developing cognitive and personality strengths, it will be *intrinsically* rewarding, not just extrinsically so. Your great challenge as a trader is to develop a process that is so internally rewarding that it will not break down when external rewards aren't forthcoming. A skilled, successful trader wrote to me about knowing all the right things to do, but not cultivating the kind of routines that would routinely ground him in those right things. Traders in such a situation assume that "discipline" is their problem, and they push themselves harder to make themselves do the right things--only to have such a push take them further from the joy in what they do. If you want to follow a disciplined process, you have to find a way to make the process rewarding and enjoyable. The best way of doing that is to yoke what we *need* to do with what we're *good* at doing. We most often lose discipline because we're more concerned about being disciplined than being fulfilled. 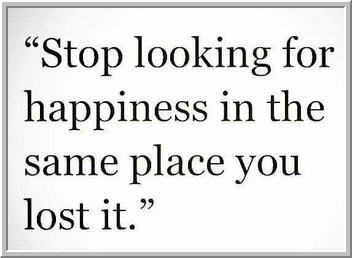 The first step to turning that situation around is to stop looking for our happiness in the very place we lost it.